While fantasy football may have started out as a geeky, niche hobby, it's since grown into a pop-culture phenomenon, even forming the basis of the sitcom The League. One of the big reasons for that spike in popularity is the wealth of online tools that help to achieve better performance playing it. There are many apps for this purpose so it can be hard finding the right app to help you. 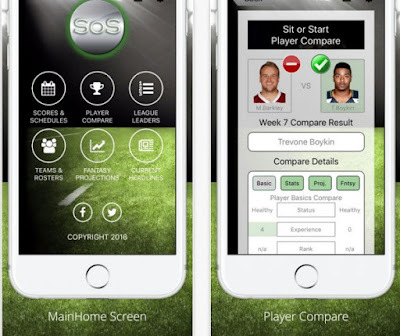 No worries, we found a sports app specially for improving your fantasy football game. Let’s discuss about it. Developed on android and IOS platform, easy for using and the best option any fantasy football player needs to have on their phone. This app gives the users many detailed analyses and complete statistics about teams, players, and every information they need to improve their game performance. With the help of this app, the users can use the statistics they get to create the best fantasy football tactics, getting on top of the fantasy football league. This app is quite simple, suitable for every lover and player of fantasy football. Giving the exact information, the players need to create the perfect team. The app offers complete information and detailed statistics about the fantasy football league. From scores and schedules, analysis and statistics with details as player and team stat and fantasy projections, season and weekly stat breakdowns, side by side player comparisons, expert rankings, to player and team analytics and charting. Aside from these features, the app is working on new upgrades as IDP rankings, alert notifications with news and status of players,team game stats,to integration with external services, for offering you the best app for fantasy football out there.